Items of work consist of: oil detention basin; place and compact earth material and backfill; seeding, Substation Concrete: provide foundations and anchor bolts for substation structures and electrical equipment; provide type "C" cable trench. Installation of Government-furnished equipment (GFE): Four (4) 230-kV power circuit breakers, eight (8) 115-kV power circuit breakers, five (5) 230-kV coupling capacitor voltage transformers, sixteen (16) 115-kV coupling capacitor voltage transformers, twelve (12) 115-kV current transformers, vertical switchboard sections, eleven (11) 230-kV disconnecting switches, thirteen (13) 115-kV disconnecting switches, and four (4) 115-kV disconnecting switches with ground blades. Provide 13.8-kV pad mounted transformer, 14.4-kV combination interrupter switch and fuses, 14.4-kV voltage transformers, 208 V resistor, 125 V ac distribution panelboard, and control cables. Provide associated outdoor electrical equipment and material. Furnish and install 115-kV Tie Line from Williston 2 XFMR KV2A 115-kV Bus Structure to Williston substation. Construct four (4) reinforced concrete foundations for Type 149Y (BP) transmission line steel pole structures with Government-furnished anchor bolt cages. Install one (1) Type 149Y-55 (BP) steel pole structure, 0/1, on concrete foundation for the 115-kV Tie Line from Williston 2 XFMR KV2A 115-kV Bus Structure to Williston substation. Install one (1) Type 149Y-50 (BP) and two (2) Type 149Y-55 (BP) steel pole structures on concrete foundations for the 115-kV MWEC Trenton-Williston 2 (Lower Yellowstone) Transmission Line.Furnish and install 115-kV MWEC Trenton-Williston 2 (Lower Yellowstone) Branch Line from WC-WN structure 75/4A to Williston 2 Substation. Install Government-furnished vertical switchboards. ICS to provide the power and control cable from the 230 and 115-kV power circuit breakers, the 230-kV power transformer, the station service DWA, and instrument transformers into the control panels in the service building. The Ashtabula wind farm is the largest wind farm in North Dakota and consists of 250 turbines. Ashtabula I project consisted of the construction of the Barnes County Collector Substation including pier drilling, excavation, concrete, structural steel supports, high voltage accessories, aluminum bus duct, breakers, switches, arrestor, transformers and ground grid for the 131 turbines. 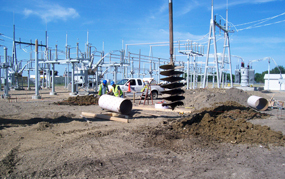 Ashtabula II is the 230/34.5 kV substation near Luverne, ND and consited of building an entrance road to the substation pad and building up the pad which occupies approximately 5 acres. Work on this project also consisted of pier drilling, excavation, concrete, structural steel supports, high voltage accessories, aluminum bus duct, breakers, switches, arrestor, transformers and ground grid for the 80 turbines. This project involved the construction of 2 - 115kV substations for the Langdon Wind Energy Center which consists of 106 turbines and a 35 mile long transmission line. 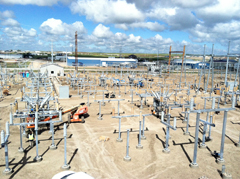 The work included excavation, concrete, structural steel supports, high voltage accessories, aluminum bus duct, breakers, switches, arrestor, transformers and ground grid. The deep cylinder concrete supports were placed with the use of caissons, drill augers and displacement pumps due to the high water table and poor soil conditions. Constructed a new 15,000 kVA, 69-12.47/7.2 kV substation to replace the existing water plant substation. The substation was built on marsh type soil with a high water table. The entire site had to be over-excavated three feet and suitable fill hauled in to accommodate construction. A relatively new slip forming method was used to pour 20’-35’ deep concrete piers. The concrete piers ranged from 2-4 feet in diameter and were placed concurrently with the displacement of the ground water. 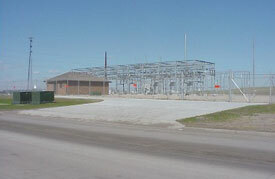 The project consisted of the installation of a new 115 kV ring bus at the existing transmission Spiritwood Substation including six 115 kV circuit breakers, three line terminals and two 115/12.5 kV transformer taps and associated support equipment including nineteen 115 kV disconnect switches and one 46 kV disconnect switch. ICS, Inc.© 2014. All Rights Reserved.